Welcome home! Whether you’re traveling to the Oklahoma City area for leisure or business, this spacious Oklahoma City house invites you to kick off your shoes and make yourself at home. The private gated community offers peace of mind and security, while the open floor plan and large rooms provide plenty of space for everyone. 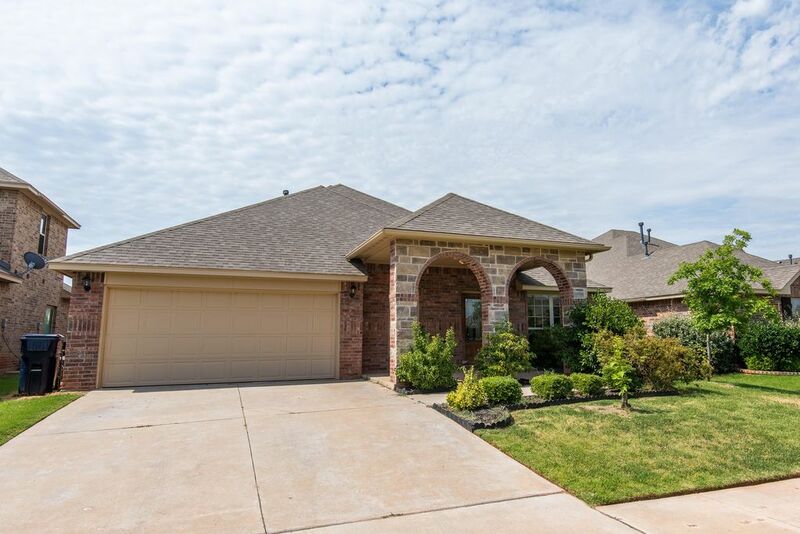 Ideal for families, corporate stays and business travelers, the home sits in a convenient location to major Oklahoma City and Edmond interstates and highways. No stuffy décor here; all of the furniture is comfortable and versatile but still stylish. From the plush towels to wrap up in after a shower to the soft microfiber sheets to lay down in after a long day, everything is cozy, just like at home. Gather in the family room with gas fireplace for a family game night or relaxing evening in. Spend the night binge-watching your favorite TV shows and movies thanks to plenty of entertainment options through cable, Netflix and HBO on demand. A second seating area provides additional space if you want to spread out. While you’re here, enjoy your personal theater room. Admittedly, the room is small but the screen is big! Feel free to bring your favorite Blu-ray or DVD to watch on the provided PlayStation 4 or you can pick something from Netflix, HBO on demand or from our library of complimentary movies. Not only are movies fun for all but for anyone that likes to play games, it’s a new experience. We have provided 2 controllers for the PlayStation 4 and several games. The fully-equipped kitchen allows you to channel your inner Martha Stewart and cook up delicious meals and snacks. It offers granite countertops, center island and four-person breakfast table. You can also gather around the 8-person dining table for meals and good conversation. When you're ready to turn in, the master suite is waiting. Sink down in the sunken bath and let the hot water wash your stresses away, before drifting off to sleep in the king bed. The suite also includes a large walk-in closet and flat-screen TV with access to streaming channels like Netflix and HBO on demand. The morning routine is a breeze with the master bath's separate walk-in shower and dual sinks. The additional three roomy bedrooms each have a queen bed, offering plenty of sleeping space and privacy for everyone. Your comfort continues throughout the rest of the house, with central air-conditioning and heat and laundry room with washer and dryer and ironing board so you can pack light. If you need to stay in contact with work or just want to check Facebook, the house also comes with Wi-Fi. For your convenience, we also provide a portable crib and a highchair. We do ask that you please bring your own linens for the crib and please keep the highchair clean and ready for our next guests. Start your day with a cup of coffee and end your day sipping on a glass of wine in the fenced-in backyard with patio, table and chairs. We even offer a storm shelter for your peace of mind during Oklahoma’s storm season. Only 15 to 20 minutes from the Oklahoma State Fair, our home is a great spot for fairgoers traveling in from other parts of the state and the country. It provides easy access to Edmond and is within a 30-minute drive of most anything in the Oklahoma City metro area. If you don’t feel like cooking, check out the numerous area restaurants and bars. The Quail Springs area, an 8-minute drive away, features a movie theater, restaurants and plenty of retail stops. This house is in great condition and is setup to be warm and comfortable for our guests. Its location is great for North OKC as well as Edmond visits. It’s in a terrific neighborhood that’s close to everything you need as well as lots of entertainment offered in the nearby Quail Springs area. Build in Microwave above the oven. The kitchen has granite countertops and is fully equipped with everything you need to cook or bake just about anything. There are two tables. one that seats 8 and another that seats 4. There is a 55" TV in the Living room and a 32" TV in the Master Bedroom. Cable, Netflix and HBO Go are included. Great property for a relaxing family vacation. This property has everything you need for an extended weekend or longer. The neighborhood is just a beautiful as the property. I was traveling with my teenage children and parents and everyone had enough room to spread out and relax. Clean, Spacious & Great for Families! Rooms were a great fit for our family. All of the beds were so comfortable, and everyone enjoyed having their own spaces! Kitchen was well-equipped, and had everything you needed to prepare meals. This home also has a theater room, & PlayStation games on the big projection screen made for a very fun night with the family. We have stayed in Casey's properties before, and he is a super host, as well as very easy to reach if I have questions. I would definitely recommend this home to anyone staying in the Oklahoma area. Thank you for sharing such a fabulous home with us! Really NIce House in Gated Community! I stayed at this home for 25 days, starting in late November. It's very clean and new-looking, nicely furnished and decorated, and very roomy. It has four bedrooms, all on the ground floor, so no stairs to deal with. Two separate living areas, one with a large dining table and sofa, the other with TV and two sofas, all very comfortable. Even has a small theatre room. The master bedroom is spacious, with a king-size bed, and its bathroom has a nice big tub and also a shower, with dual sinks. Remaining three bedrooms each have a queen bed, and I was glad to see that instead of multiple smaller beds or bunk beds. Dual sinks and tub/shower in the hallway bathroom. Both bathrooms were very clean, with nice spacious, marble countertops. Lots of closet space all over the house, for anyone who needs it. The kitchen is well equipped with everything needed for a long stay. Nearly every room has a table-top power plug with setup for charging electronic devices via a standard USB cable, that came in handy. The owner obviously thought about adding simple things like this to make for a pleasant stay for guests. The main living room has very comfortable sofas and the TV has a great selection of cable channels and also Netflix. The theatre room can be used to watch movies but also includes a game console with wireless controllers and a handful of cool games for another form of entertainment. Another great sofa is in that room. The back-yard is quite large and is fenced in, with a shaded patio and table with comfortable chairs for sitting out there on a nice day. Neighborhood is quiet and attractive, looks like a newer development and I felt very safe there. The house is located near a good variety of restaurants and all kinds of retail stores. I had one simple question for the owner shortly after my arrival and was impressed when he responded within a half-hour of my email to him. I was completely satisfied with this home, I had a very pleasant stay there and would stay there again for sure. Everything we needed, and then some. Our family was very comfortable and enjoyed spreading out to watch movies, play games and visit.